Melbourne’s tram operator also set a target of catching more than 60,000 commuters over a nine-month period. See, after all these years, they’re still going about it the wrong way. I don’t think the deterrent of fines is really working. The measure of success or failure in revenue protection should be the occurrence of fare evasion, not the number of fines issued. If there’s a large number of fines being issued year after year, it probably means there are still lots of people evading, as you can bet only a fraction of them are being caught. Simple things like can help a lot, like consistent staffing. 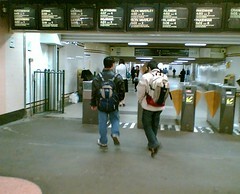 Back in 2006 I noticed the Degraves St subway gates weren’t being staffed most of the time. I took notes for about a month, and found no staff were present most of the time, even in peak hour. And I started to see people who were obviously looking around to find an open gate into Flinders Street to catch trains for free. So I did what any fare-paying customer who is sick of seeing others having a free ride would do: I issued a press release and organised a Herald Sun story! WHILE the Government subsidises a $1 million advertising blitz to shame fare evaders, tens of thousands of commuters are flowing through open barriers at Melbourne’s busiest train station. A Connex spokesperson blamed reduced staff numbers due to illness, but miraculously following that, everybody got better, and staffing of that exit jumped to 100%. The operators shouldn’t need to be told this stuff via the newspapers. It should be obvious. Random patrols and over-zealous fines haven’t worked. Put staff back on the system, make it easy to pay, and hard not to, and evasion will drop. By the way: technically Inspectors are Authorised Officers, who are employees of the private operators who are authorised by the government with powers under Transport Act. And they don’t issue fines directly, they write out a Record Of Non-Compliance (RONC) which goes to the Department of Transport, which then decides whether or not to issue the fine. The operating company gets $30 from the fine. I get so cross when I get on a tram and no-one else bothers to buy or validate a ticket. Don’t suppose you would know what Sydney trains fare evasion rate is compared to Melbourne’s? There seemed to be a lot more staff around in Sydney stations and they also seem to take ticket checking more seriously. Andrew, according to a 2005 Auditor General’s report, it was 2.3% in 2005 (down from 4.1% in 2000). For Sydney buses it was 1.1% (0.7% in 2000). So it was you who spoiled the fun in the DeGraves underpass? Party pooper. I refuse to validate my tickets on trams. I pay $170 a month for my ticket and I’m not prepared to risk ruining it unless it’s within a couple of days (at most) before the card is due to expire. The readers do something to my ticket that makes it unreadable at train stations and then I face attitude from the moronic thugs at Spencer St who go “You must remember to validate!” I WOULD IF YOUR FRIGGIN’ MACHINES DIDN’T KEEP EATING MY CARDS! Frank, lots of people don’t re-validate their existing ticket when boarding a tram. The stats gathered from it are flawed (and not acted upon anyway), so why bother? Ian, I wonder if that’s just people avoiding paying full stop or concession fraud as well? I know from my visits to Sydney there are plenty of staff around the inner-city stations, but less so in the burbs. Ren, I hear what you’re saying about wearing out Monthlies, but it makes me more angry after having paid for a Monthly or Yearly to see people blatantly skipping through without paying. Actually, cards wearing out is one of the things Myki will actually fix when it eventually turns up. Ticket inspectors on 4 trams I caught on Friday. They’re never there when blokes are pissed off their nut, junkie scum or nutbars or on the tram! As I have said countless times before, not necessarily in this forum but to anybody who’d listen, and even then to some who don’t. The only way to stop fare evasion is to place a barrier at all points of entry and exit to the system. Busses have them, they are called drivers. Some stations have them, all stations should have them and they should be activated all the time. Trams have nothing, and I’m surprised at the low evasion figure you quoted. It is probably low because it was only the passangers who were unable to get to a validator once the inspectors got on that were pinged. Trams could very easily have a barrier at entry and exit. Front door entry only, rear door exit only. Have a space between front door and tram interior for passangers to pool whilst vehicle proceeds to next stop, have a TVM in this space. MYKI won’t stop evasion it offers no extra barrier. Nigel, I agree with you to an extent. The only way of stopping fare evasion is to make sure people get their ticket checked on every trip. Barriers in the trams though? I don’t think it would work. While I did see something similar on Amsterdam trams ten years ago, these days they need to provide wheelchair access. On many low-floor trams the wheel cavities mean there’s only a narrow corridor down the length of the tram, and then there’s the question of how the barrier would work with wheelchairs, prams etc, and how much space would be taken up (with current crowding it’s at a premium). I suppose another idea might be the type of enclosed stops you see in Brazil, but even these would present challenges; fare gates pretty much have to be staffed to be effective and practical.